The Fiat 600 (or "Seicento") [say-chento] is a city car produced by the Italian automaker Fiat from 1955 to 1969. Measuring only 3.22 m (126 in) long, it was the first rear-engined Fiat and cost the equivalent of about € 6,700 or US$ 7300 in today's money (590,000 lira then). The total number produced from 1955 to 1969 at the Mirafiori plant was 2,604,000. During 1960s, 1970s, and 1980s, the car became very popular in countries such as Spain (as Seat 600), where it became the icon par excellence of the Spanish miracle, and Argentina, where it was nicknamed Fitito (a diminutive of Fiat). The car had hydraulic drum brakes on all four wheels. Suspension was a unique single double-mounted leafspring - which acts as a stabilizer - between the front wheels coupled to gas-charged shock absorbers, and an independent coil-over-shock absorber setup coupled to semi-trailing arms at the rear. All 600 models had 3-synchro (no synchro on 1st) 4-speed transaxles. Unlike the Volkswagen Beetle or Fiat 500, the Fiat 600 is water-cooled with an ample cabin heater, and while cooling is generally adequate, for high-power modified versions a front-mounted radiator or oil cooler is needed to complement the rear-mounted radiator. All models of the 600 had generators with mechanical external regulators. The top speed ranged from empty with the 633 cc engine to with the 767 cc version. The car had good ventilation and defrosting systems. 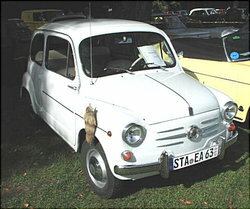 A year after its debut, in 1956, a soft-top version was introduced, as well as a six-seater variant — the Fiat 600 Multipla. It was a precursor of current multi-purpose vehicles. 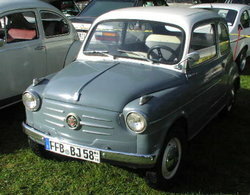 The Fiat 600 was also manufactured at Fiat Neckar in Germany between 1956 and 1967. 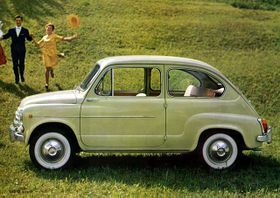 Presented in a first time as Jagst 600, in 1960 with the release of Fiat 600D it became Jagst 770. The model was manufactured until the end of 1967, more than 172,000 copies. Also in Spain, the 600 model was made under the make of Seat, from 1957 to 1973. Up to 797.319 Seat 600 were made. The Spanish exported them to Germany, Austria, Belgium, Denmark, Finland, Greece, Netherlands, Italy, Norway, Portugal, Colombia, Chile, Ecuador, Guatemala, Panama, Angola, Cameroon, Congo, Ivory Coast, Etiopia, Gabon, Guinea Ecuatorial, Reunion Island, Lebanon, Senegal, Somalia and Zaire. This car motorized Spain after the Spanish Civil War. In former Yugoslavia the model was very popular, and was produced under the name Zastava 750 (later 850), nicknamed "Fića" in Serbian, "Fićo" in Croatian and "Fičo" in Slovene. It was produced by the Zastava factory in Kragujevac (in Serbia) from the early sixties until 1985. Zastava 850 had many improvements from original model. The Fiat 850 is largely derived from the 600, but introduces a fully-synchronized transaxle, front disc brakes, and an alternator. The Fiat 850 is thus a popular source of 'upgrade' parts for the 600, but these upgrades can be difficult or costly as few of the parts can simply be exchanged without modification. In the USSR a similar car was manufactured, Zaporozhets ZAZ-965, produced from 1960 to 1969. It was the first car mass-produced in Ukraine (then part of USSR). Despite speculations that the design was copied from the Fiat 600, ZAZ factory representatives say the car was an exclusively Soviet design, created by Soviet ZAZ engineers jointly with colleagues from Moscow's NAMI. 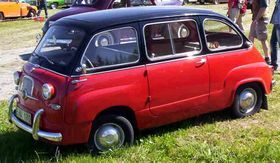 The original Fiat Multipla and 600 Multipla were based on the Fiat 600's drivetrain, model 1100 coil and wishbone independent front suspension, and sat 6 people in a footprint just 50 cm longer than the original Mini Cooper. The driver compartment was moved forward over the front axle, eliminating the boot in effect but giving the body very MPV-like one-box look. Behind the front seat the vehicle could be arranged with a flat floor area or a choice of one or two bench seats. Until the 1970s it was widely used as a taxi in many parts of Italy. A 633 cc right hand drive Multipla was tested by the British magazine The Motor in 1956 and was found to have a top speed of 57.1mph and could accelerate from 0-50mph in 43.0 seconds. A fuel consumption of 38.4mpg was recorded. The test car cost £799 including taxes on the UK market. A Fiat 600 Multipla towing a caravan is used in the video clip of the Crowded House hit Weather with You from their 1991 album Woodface. The Multipla name was re-introduced in the late-1990s for the Fiat Multipla compact MPV. With a cost of nearly double that of a standard "600", they were made in a very limited production. It is believed that fewer than 100 exist today, each one being unique. 32 Jolly cars were used as taxis on the island of Catalina off the coast of Los Angeles in the USA in the years 1958-1962.